Highfield Awarding Body for Compliance (Highfield) have a highly competent development team who have built a number of successful tools on which the business is run. As the business continues to grow, they are under constant pressure to build new features and tools alongside the general maintenance of their platform. Razor were engaged to work alongside the internal development team in order to provide specialist support on performance and workflow improvements. The net result was a 91% reduction in time spent on business critical tasks and an additional reduction in load on the systems. 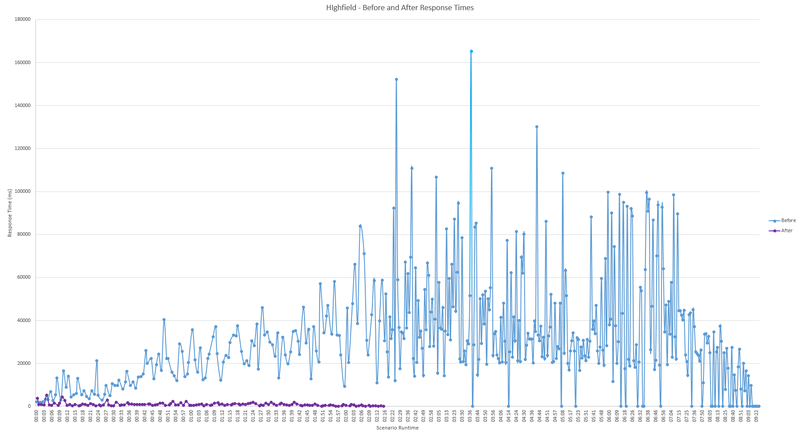 Starting out with a maintenance task (an interface upgrade) allowed our team to develop a good understanding of the codebase while at the same time providing immediate value to Highfield. Once this work was complete, we moved on to the consultancy project, which was split into two areas. Our initial focus was on increasing efficiency and improving the robustness of the codebase. As a business who is always pushed to work at the cutting edge of web technology, we are naturally exposed to a vast range of tools, techniques and software that most internal development teams don’t have the opportunity to spend time assessing and implementing. This allowed us to suggest the most appropriate course of action to the team, without them having to go through a time consuming and potentially costly trialling period. With a history of developing highly scalable applications, we were well placed to be able to apply some of the latest tools and techniques in order to find the performance gains required to make a cost saving in this area. Our performance testers began by simulating high load on the system in order to provide a benchmark. We then profiled the application and database and introduced mechanisms to reduce database connections. We added transactions for durability and data integrity, introduced levels of caching and most importantly altered the workflow removing long running tasks from the web context to background worker roles freeing up threads and connections to complete more web requests. Users were kept informed with notifications that were pushed back in real time using web sockets. We then ran our performance tests again, and the results speak for themselves! * Performance figures (both pre and post) are taken from our test environment. Get in touch to find out how we could work alongside your team. Delivering a new portal to enable customer self-service.